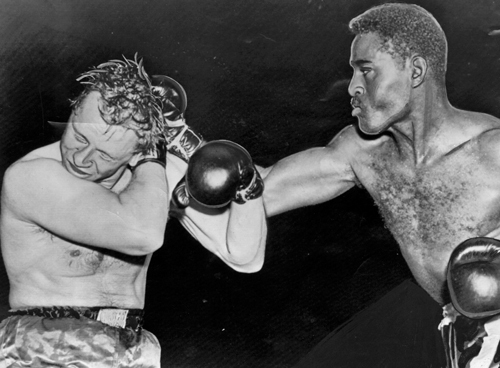 There’s little doubt that Ezzard Charles is one of boxing’s most underrated champions. A skillful technician, he holds wins over a long list of great fighters and he surely deserves to be better recognized for his achievements. 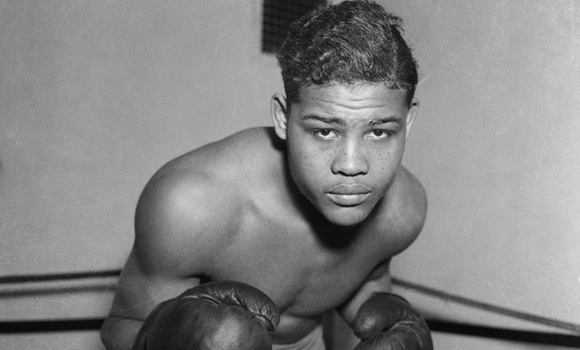 However, the problem was that Charles’ reign as heavyweight champion of the world followed that of the enormously popular “Joltin’ Joe,” the legendary Joe Louis. It was a chance encounter with Cuban featherweight sensation Kid Chocolate that first made Charles want to be a fighter. It was August of 1932 and the ‘Kid’ was due to face journeyman Johnny Farr in Charles’ hometown of Cincinnati. The young Ezzard was so impressed with the beautifully tailored suit worn by the famous champion that he decided then and there he wanted to be a prizefighter. 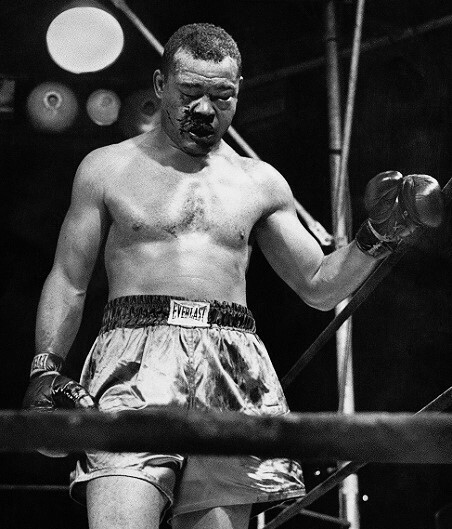 Joe Louis in his prime: The Brown Bomber was a living legend. It wasn’t long before Charles found a new idol though, one he felt better represented him, one he could relate to on a more personal level. Enter Joe Louis. Louis, like Charles, had faced many of the same struggles growing up as a young black man in America and he had proven that despite the obstacles, the glory and the riches were attainable, at least if you were a fighter. He was an idol for so many black kids of the time, Charles included. Charles’ love for the Brown Bomber inspired him to spend countless hours listening to fights on the radio and in 1936 he decided to join a local boxing gym. Little did the young Ezzard know, he would forever be linked with his boyhood idol when all was said and done. By 1948 Charles had more than proven himself a master boxer. He had the footwork of a dancer, threw his punches with pristine technique and speed, and if he wasn’t the most powerful of punchers, his excellent timing enabled him to knock out his fair share of opponents. Despite not getting a shot at the title in the lower weights, his heavyweight campaign gave him hope. 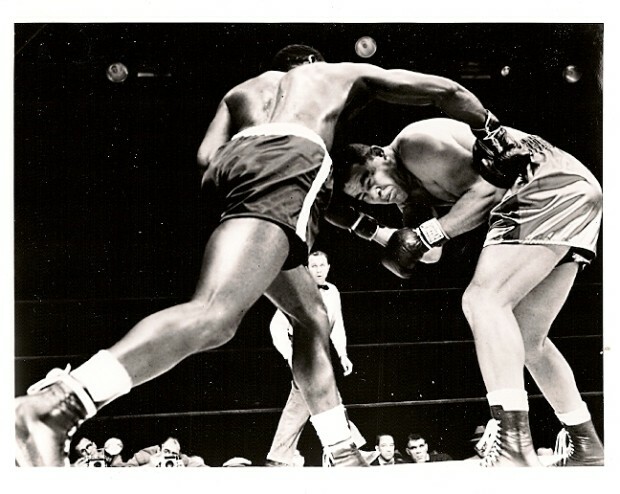 He was scoring wins over men much bigger and heavier and soon there was talk of a showdown with champion Joe Louis. 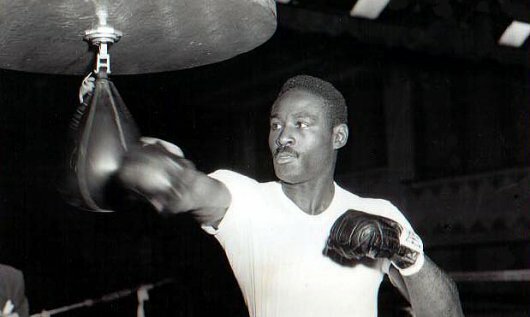 Ezzard Charles: a master boxer. 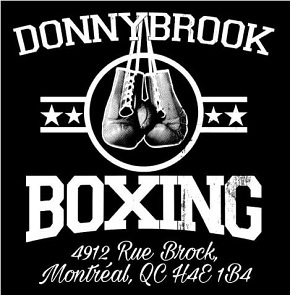 In March of ’49 Louis decided to retire and turn to the work of promoting fights. 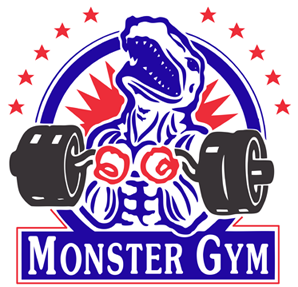 In conjunction with Jim Norris and Arthur Wirtze, he set up the International Boxing Club. The idea was to create a monopoly and own the rights to all heavyweight title fights. In order to designate a new champion, the I.B.C signed four of the top contenders to contracts, Gus Lesnevich, Jersey Joe Walcott, Lee Savold and Ezzard Charles, and then held a tournament to decide Louis’ successor. Ezzard Charles became heavyweight champion of the world on June 22 in 1949 when he won a unanimous decision over Jersey Joe Walcott but few fans were overly pleased about it. Charles lacked power, they said; he’s too careful, they said; he’s not really the champion, they said. 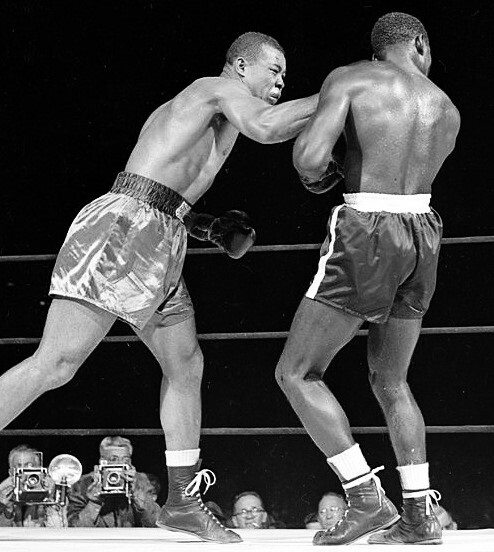 In fact, Ezzard Charles was a more than worthy champion; he just wasn’t Joe Louis. 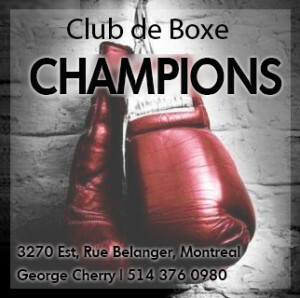 Champion Charles stopped Freddie Beshore in round 14. Charles made three defenses of his title, against Gus Lesnevich, Pat Valentino and Freddie Beshore but it was even clearer now that the public just wasn’t all that keen on the new champion. The Lesnevich fight drew a poor crowd, the fight against Valentino, the first in the Bay Area since Jack Johnson beat Stanley Ketchel back in 1909, saw Charles introduced first and heavily booed by a pro-Valentino crowd, while the Beshore fight set a record for lowest attendance at a heavyweight title bout, with a lowly 6298 people turning up. Louis, the peoples champion, had been busy himself. He was officially retired but was fighting exhibitions with impressive regularity and according to all reports, wasn’t exactly taking it easy on his opponents. It was becoming apparent he was ready to make a comeback, a fact all but confirmed on the night of December 7, 1949 when Louis and Pat Valentino took part in a ten round exhibition in Chicago. 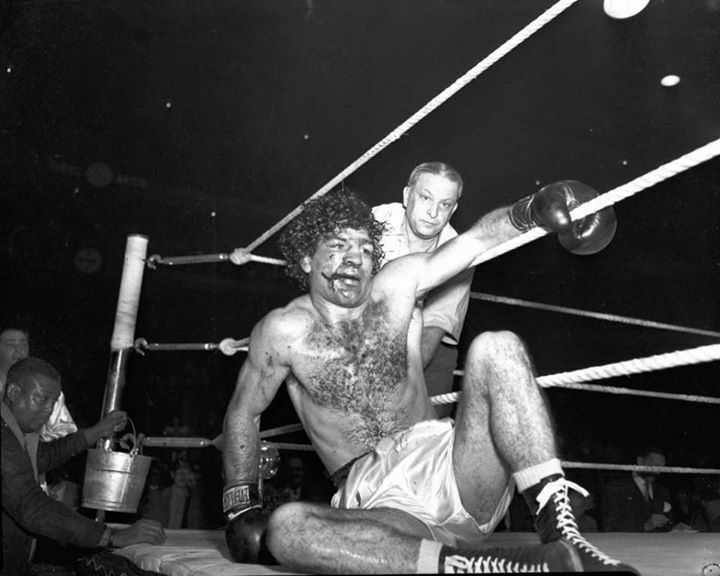 Pat Valentino takes a pounding in his exhibition loss to Louis in 1949. Afterwards, when asked whether or not he thought Louis would return, Charles replied: “Joe is certainly going through all the motions of a man who is going to stage a comeback. I think he will.” Six months later, it was official: Joe Louis was back and he wanted his crown. The public wanted to see their hero back in the ring, while Ezzard Charles was keen to show them he was the true heavyweight king. 22, 357 people attended the Louis vs Charles championship match. Louis may have felt he was in his best shape since the war but the scales said otherwise. He weighed in at 218 pounds, the highest of his career, while Charles weighed 34 pounds lighter at 184. Joe scores with a right. 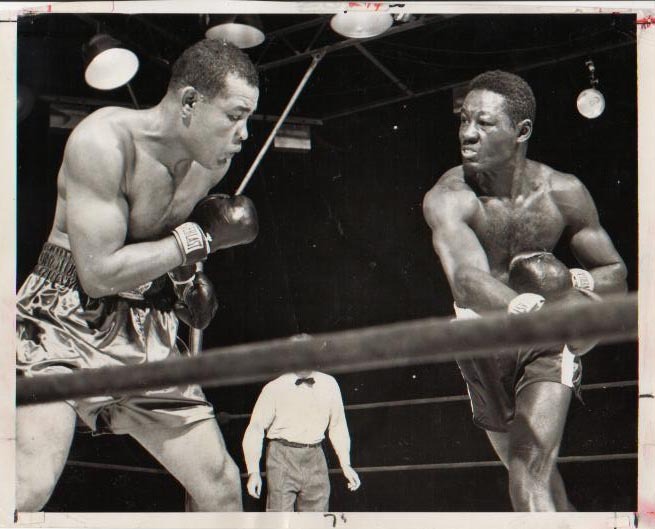 On September 27, 1950, Ezzard Charles did what so many before him couldn’t do: he out-boxed, out-maneuvered, outlasted and won a decision victory over the great Joe Louis, becoming the only man to go the full fifteen rounds with “The Brown Bomber” and win. The match itself showed just what a master of The Sweet Science Charles was as he bested Louis in every facet of the fight. He beat the ex-champion to the punch while slipping the big bombs from Joe, punches that many before him had struggled to avoid. His footwork befuddled the bigger man and kept him off balance for most of the fight. He even had the Bomber in serious trouble and on the verge of a knockout in round 14, but Louis held on. The judges scored it unanimously: 10-5, 13-2 and 12-3. Louis was battered and bloodied in the late rounds. Love both guys…love this fight…nice article. Both of these fighter was great fighters.A lot of the time when you rank the best fighter pound for pound you have to look at competition that they had in their and who they fought..Louis had. Charles,Walcott,Max Bear,Max Smelling and many more he fought anybody.Jack Johnson had beat Sam Lanford,Sam Mcvey,Jim Jeffreys and Ali had Frazier,Foreman,Norton,Lyle and Shavers and he fought them all.